Three times in the last 5 weeks we have crossed into the US to help with 1812 events in Cape Vincent, Fort Ontario in Oswego and this weekend Sackets Harbor. Once again we would like to thank Connie Barrone and the Sackets Harbor staff and volunteers for welcoming us so warmly. One of the highlights of this year's event was the dedication of the permanent memorial to the US troops who fell 201 years ago. Local dignitaries, politicians and representative from the US Arm Forces were on hand as re-enactors assisted with the first wreath laying. IMUC fielded 19 muskets this weekend along with our Sgts and Officers. Best turn out for us in years! What a spectacle! The field, before the fort’s moat, was covered side to side!! I think the holes for the pyrotechnics were extra deep as well! Jim Hill and his crew certainly did a terrific job. 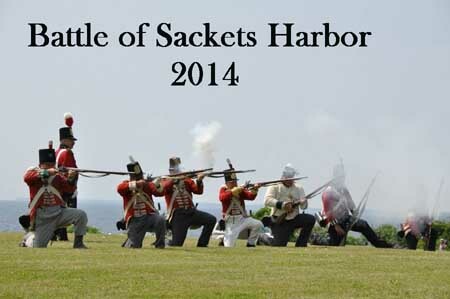 With 1100 re-enactors registered, it put 300 on the side of the redcoats and just a few less on the US side! Our IMUC/Campfollower cams were out in full force. Pictures c/o Sarah, Nancy, Darlene and Deb so far! Sarah’s shots of the explosion and the scaling of the walls are especially well done! 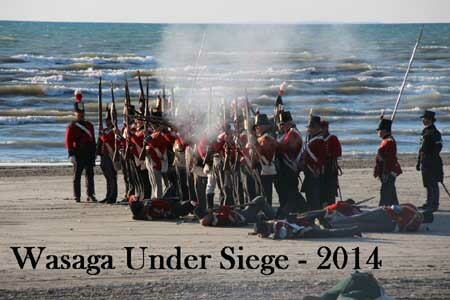 The Siege of Fort Erie was the bloodiest of the War in Canada. IMUC and the Glengarry Light Infantry both fought there, long and hard. Many members of the original Incorporated Militia were from the area as well. We proudly were part of the Nancy Island/Dave Brunelle celebration of the 200th anniversary of the Sinking of The Nancy - August 14, 1814 & 2014 !. So many of our re-enactor friends showed up that the island seemed to be riding a little low in the water! Having the weather break just before the Saturday evening battle was terrific. The Niagara "ghost ship" slipped in and out of the mist as it fired upon us from the bay! The Nancy Island site a s well as Dave Brunelle and his army of volunteers certainly know how to stage a historical celebration! 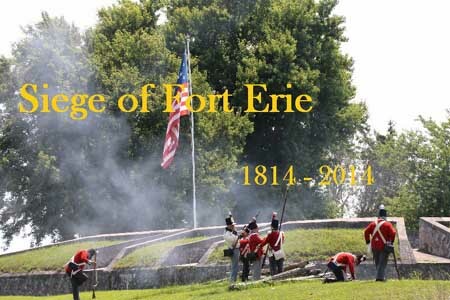 The Incorporated Militia of Upper Canada helped to garrison Old Fort Niagara this past weekend. In December of 1813 the Incorporated Militia helped with the original capture of the fort. IMUC was responsible for rowing the garrison soldiers from Fort George across the river for the attack. Once the fort had fallen, the Incorporated Militia were among those that were sent to burn the villages near the fort. This time, we showed restraint, and didn’t! We would like to thank the fort staff and volunteers for again treating us so well.